Friday's launch of the iPad mini has been eagerly awaited by physicians who are particularly excited that the device easily can fit inside a lab coat. Epocrates, a maker of point-of-care applications for medical professionals, gathered data from 48 different physicians that use its products. One in three of those physicians said they are planning to purchase an iPad mini due to its convenient small size. With a height of 7.87 inches and a width of just 5.3 inches, the iPad mini also passed what Epocrates called the "lab coat test." Lab coats worn by medical professionals have pockets sized 8.5 inches high and 7.5 inches wide, which means the device can be easily carried by a physician. And 90 percent of physicians contacted said they believe the iPad mini will make it easier for them to bring the device between exam rooms and on hospital rounds. A mockup of the Epocrates application on Apple's new iPad mini. Source: Epocrates. "Compared to the general populace, physicians are early and high adopters of Apple products," the company told AppleInsider. "A large majority of physicians own an iPhone, and the current iPad dominates the healthcare tablet market." The medical community was quick to embrace the iPad when it first hit the market. For example, the School of Medicine at Stanford University began equipping students with Apple iPads only months after the first-generation device launched in 2010, while a number of hospitals also found uses for the device. 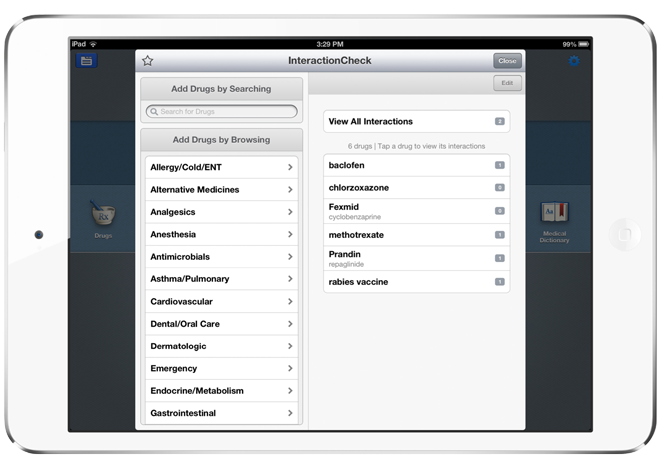 In 2011, the U.S. Food and Drug Administration approved the first diagnostic radiology application for viewing medical images and making diagnoses on the iPad. Professionals are allowed to use the application when a full-size workstation is not available. And earlier this year, one survey found that more than a quarter of European doctors use an iPad at work, while another 40 percent said they planned to buy an iPad within six months. But the latest input from Epocrates users suggests that the iPad mini could prove to be even more convenient for healthcare professionals than the full-size 9.7-inch iPad, which does not comfortably fit inside a traditional lab coat.